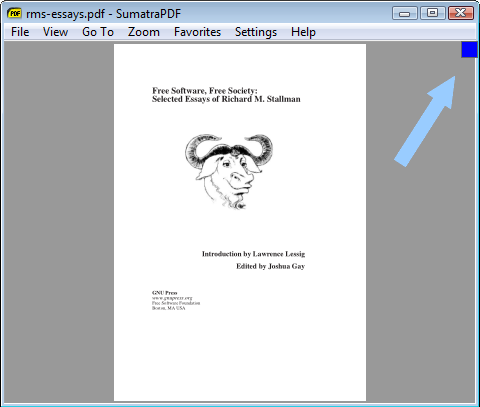 sumatra_earmark lets you earmark any pdf page in SumatraPDF . Each earmarked pdf page displays a blue square in the top right corner. Quickly toggle earmarks on/off with mouse or keyboard. Quicky jump to next/prev earmark page. Earmarks are autosaved to a textfile. Any pdf with at least one earmark shows a grey square in top right corner. Handy popup grid for quick jump to a specific earmark. Unique earmarks for different pdf files (based on file name). The pdf files are not edited. Place a link in the Startup folder to autorun it Windows starts. sumatra_earmarks is really "feature request ware". That is, I hope the SumatraPDF devs like this and build in the functionality.